Debugging is the developer’s best friend when it comes to understanding how code really executes – especially when trying to figure out why the code is not behaving as expected. Debugging works exceptionally well in monolithic apps or in service-oriented apps when you know exactly to which service instance you need to attach your debugger. In modern application architectures that embrace micro-services which either run on your machine, in a container or in the cloud, it is getting trickier to attach your debugger to all those JVMs, CLRs, PHP or Node.js engines. Amazon in their recent AWS X-Ray announcement made a good step forward to raise the awareness of distributed tracing. Zipkin is another library that tries to address the same problem of collecting transactional data of highly-distributed applications. I have to admit that I haven’t used either of them but AFAIK both require manual instrumentation in order to trace transactional executions, and you need to take care of passing the trace token (Transaction ID) from one tier to the next. Transaction Flow is a popular visualization of the data highlighting how transactions flow through the distributed application. Instead of just tracing Dynatrace also tells you which problem patterns your code is currently suffering from. Allowing you to focus on fixing and not finding. 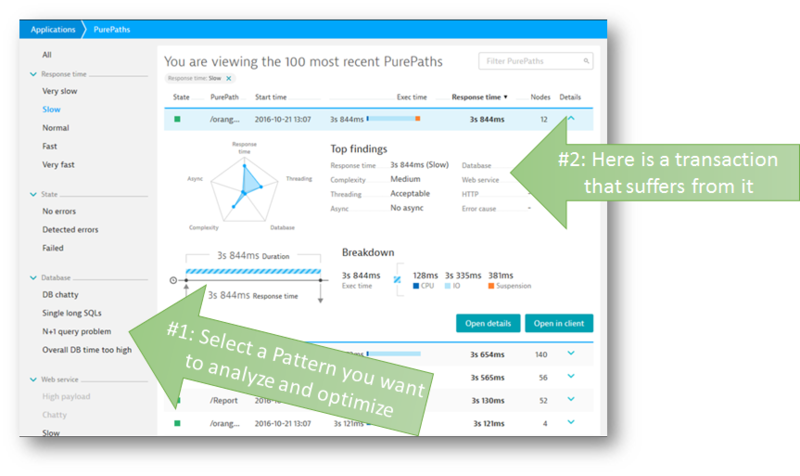 There are many cool things I love about PurePath. You can find a YouTube Tutorial for all the reasons on my channel if you want to learn more – but here are some of the things everyone should know! 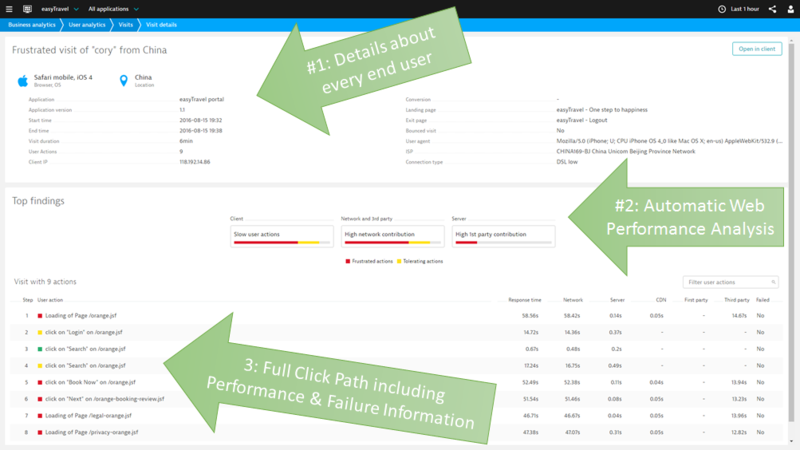 The PurePath Tree itself shows the real power of Dynatrace. Automatic Tracing across runtime and thread boundaries and capturing additonal performance relevant information through Auto Sensors. Learn more about Sensors by watching these YouTube Tutorials: Capturing Context Data with Sensors and Advanced Sensors. 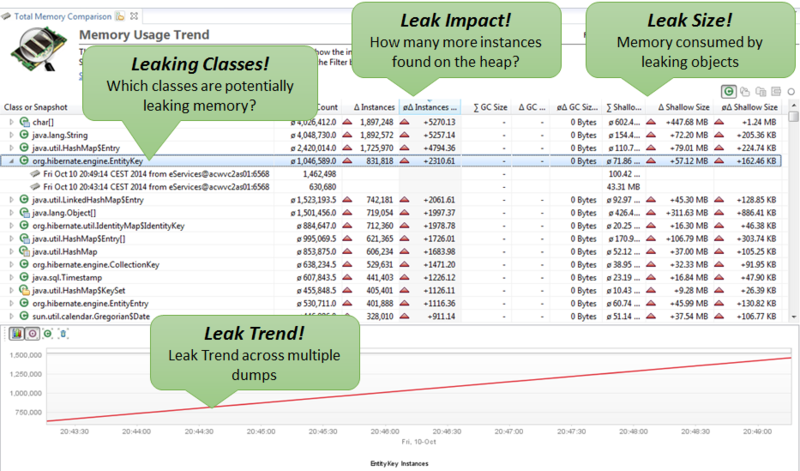 Dynatrace automatically provides Memory, CPU and Thread Dump analysis of every tier monitored. 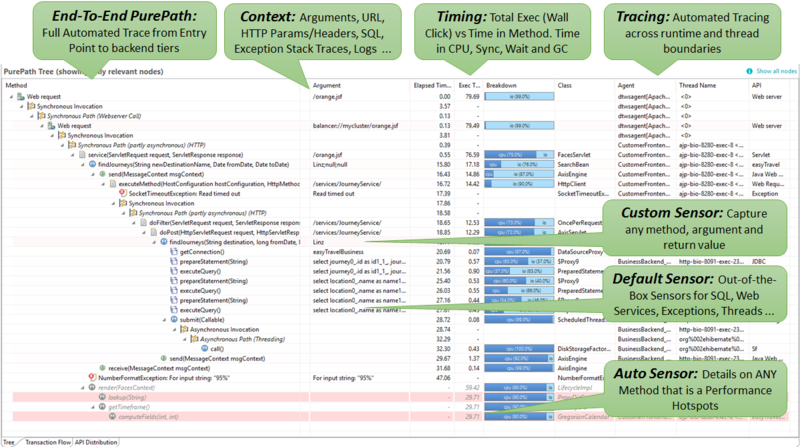 All through the Dynatrace Client or the REST API. 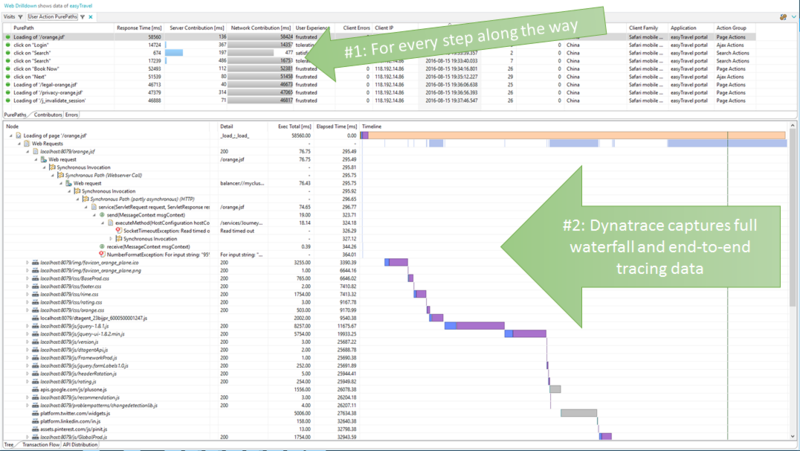 Make sure to watch my Tutorial on Memory Diagnostics with Dynatrace to see this in action. 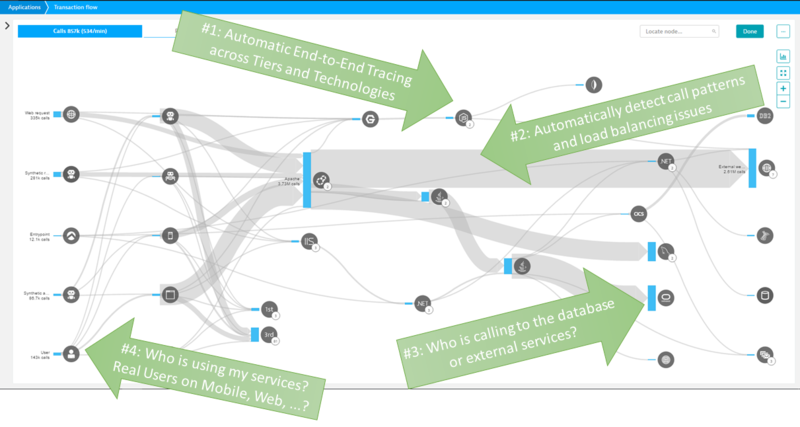 Dynatrace captures every user interaction starting from the device. Helps you understand how users navigate through your application and where they struggle. Check out my tutorials on Advanced User Experience Management as well as Web Performance Optimization with UEM to learn more. About two years ago I was happy to give Developers the Dynatrace AppMon & UEM Free Trial and Personal License. You start off with 30 Days of capturing PurePath for distributed applications across multiple servers (physical or virtual doesn’t matter). After 30 days it converted to a Personal License which still gives you full features with the only limitation that it only works on your local workstation. Times have changed – so have development enviornments. I see many developers building microservice applications. They may use a local IDE but the services get automatically deployed into Docker containers, into EC2, or straight to a PaaS. To give developers free access to PurePaths in these environments we decided to provide a new Personal License Model that is not limited to localhost applications. It is our “Online Personal License” which allows you to connect agents that are distributed across containers, clouds, or old fashioned bare-metal servers to your Dynatrace AppMon Server. This also allows you to install your Dynatrace Server wherever you like and then connect agents from different machines. In order to support the use cases for developers, architects and testers, but to avoid abuse, we limit the number of concurrent connected agents, as well as enforcing a time limit (if we see agents being connected 24/7 for weeks you are probably not using it for your local development use case). I think these are exciting times because we all understand that Distributed Tracing is the new Debugging. But it shouldn’t require you to modify your code to obtain visibility. It should just work out of the box with all the bells and whistles that you expect from a modern tracing solution.